The Federal Trade Commission has published Horizontal Merger Investigation Data: Fiscal Years 1996 - 2011. 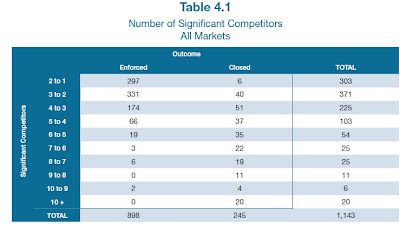 I found it interesting to notice the categories the report used to classify about horizontal merger enforcement: and the categorizes them along five dimensions: the Herfindahl-Hirschman Index before and after the proposed merger, the number of competitors in the market, the presence of "hot documents," the presence of "strong customer complaints," and ease of entry into the market. What surprised me was that the the notion of classifying merger policy along these kinds of categories is often de-emphasized in the recent economic research literature on industrial organization. Here, I'll first say a bit about the categories in the FTC report, and then compare it to the emphasis of recent empirical work in industrial organization. The data for the FTC report comes from a requirement in the Hart Scott Rodino legislation, which I described in a post last June 14, "Next Merger Wave Coming? Hart-Scott-Rodino 2011," which reviewed some of the evidence from the annual HSR report. As I noted there: "The Hart-Scott-Rodino legislation requires that when businesses plan a merger or an acquisition above a certain price--typically $66 million in 2011--it must first be reported to the Federal Trade Commission. The FTC can let the merger proceed, or request more information. Based on that additional information, the FTC can then let the merger proceed, block it, or approve it subject to various conditions (for example, requiring that the merged entity divest itself of certain parts of the business to preserve competition in those areas)." Thus, the most recent FTC report looks at those 464 horizontal merger cases from 1996-2011 where the FTC requested additional information, and whether those requests led to an enforcement action of some sort (either blocking the merger or placing conditions on it), or alternatively if the request was followed by closing the case without an enforcement action. The firsts category discussed in the report is the Herfindahl-Hirschman Index (HHI): as the report says, "The HHI is the sum of the squares of the market shares of the competitors in the relevant market." In other words, if an industry has two firms, one with 60% of the market and one with 40% of the market, the HHI would be 60 squared, or 3600, plus 40 squared, or 1600, which would equal 5200. The highest possible HHI would be 10,000--that is, a complete monopoly with 100% of the market. The lowest HHI would be for an industry with many very small firms, each with only a miniscule portion of the market. After squaring these miniscule market shares and summing them up, the result would be a very low number. Here's a table making HHI comparisons , with the columns showing how much the HHI would increase as a result of the merger and the rows showing the level of the HHI after the merger. This is measured across markets, where a given proposed merger often has implications across several different markets. Notice that none of the 14 cases where the post-merger HHI was less than 1700 and the rise in HHI was less than 99 led to an enforcement action. In the cells in the bottom right corner, if the post-merger HHI is above 3,000 and the gain in the HHI is above about 800, it's highly likely that an enforcement action will be taken. The next category in the FTC report is the number of competitors--which of course, in some ways, is based on the same information used to calculation the HHI. In the 20 cases with more than 10 competitors, there were no enforcement actions. But if the number of competitors is being reduced from 2 to 1, or 3 to 2, or 4 to 3, the request for additional information is very likely to lead to an enforcement action. The FTC report then looks at a few other categories. "Hot documents" refers to a "cases where the staff identified one or more party documents clearly predicting merger-related anticompetitive effects." "Strong customer complaints" refers to cases "where customers expressed a credible concern that a significant anticompetitive effect would result if the transaction were allowed to proceed." And "ease of entry" is determined by an assessment by the FTC staff of the "timeliness, likelihood, and sufficiency" of entry. As one would expect, hot documents and strong customer complaints make enforcement actions more likely; ease of entry makes enforcement less likely. the discussion by Liran Einav and Jonathan Levin of "Empirical Industrial Organization:A Progress Report," which appeared in the Spring 2010 issue of my own Journal of Economic Perspectives. Like all articles in JEP going back to the first issue in 1987, it is freely available on-line courtesy of the American Economic Association. merger or regulatory change. The current state of the fifi eld reflects this transition. Today, most of the influential research in empirical industrial organization looks extensively to economic theory for guidance, especially in modeling firm behavior. Studies frequently focus on a single industry or market, with careful attention paid to the institutional specifics, measurement of key variables, and econometric identification issues." Einav and Levin go on to describe how this kind of research is done, and to evaluate its strengths and weaknesses. But my point here is that the summary of HHI, number of competitors and the rest across broad categories provided by the recent FTC report is quite different in spirit than how Einav and Levin are describing the research literature. It seems to me that there are two possibilities here. The pessimistic view would be that the FTC just put together this report based on old categories and old thinking, and that it has little relevance to how antitrust analysis is actually done. 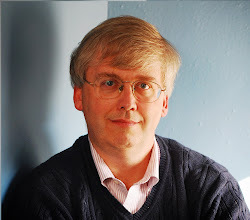 But the more optimistic view, and the one that I prefer, is that the old traditional categories of measuring market structure with methods like the Herfindahl-Hirschman Index or a four-firm concentration ratio, as well as looking at factors like ease of entry, remain a more-than-adequate starting point for thinking about how antitrust enforcement is actually done. The more complex analysis described by Einav and Levin would then be applied to the hard cases, and discussion of the fine details of hard cases can be reserved for higher-level classes.